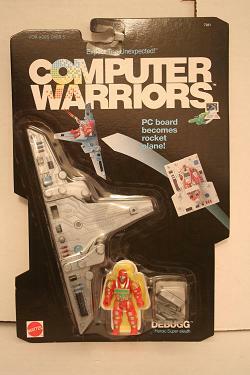 Next in line for Computer Warriors week is the figure Debugg. One of the good guys, he is a detective and apparently quite powerful, able to combat the strongest Virus, Asynk. Recently ended on eBay, as it was a very short duration auction, is a nice example of Granny and the Gators. This is one of a very small number of hybrid pinball/arcade machines ever produced, one of the others by Baby Pac-Man which is in the Preserve arcade collection. The price for this machine was really tremendous, ringing in at $1,216.12 when all was said and done. Very rarely does an example of this machine come up at all, so it is interesting to see an example of the value that the market currently places on this interesting machine.